He’s the Merc with a Mouth, the Assassin with Elan, the Wryest Wisecracker of the Weapon X Program, now in a collection of his earliest sagas! Deadpool, with sidekick Weasel in tow, sets out on a quest for romance, money, and mayhem – not necessarily in that order – only to learn he’s being hunted by an enemy he killed years before! As if that isn’t enough, the Juggernaut crashes into the action, and it’s the unstoppable vs. the un-shut-up-able! But all may not be lost if the sultry Siryn can inject a little sanity into the proceedings! 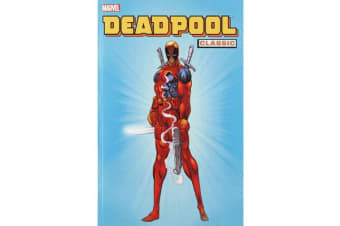 Will Deadpool be steered toward a better life by his new heartthrob, or stay the chaotic course he’s set for himself? The answer is Yes! Guest-starring the New Mutants, Banshee, Sasquatch, and more! This title collects New Mutant numbered 98, “Deadpool: The Circle Chase” numbered 1-4, “Deadpool” (1994) numbered 1-4, and “Deadpool” (1997) numbered 1.